Event that indicates that the video or audio has ended. Event that indicates that the volume has changed. This widget implements a media player, suitable to play video or audio, and with a customizable user-interface. To support cross-browser playing of video or audio content, you may need to provide the contents appropriately encoded. For audio, at least an MP3 or MP4 audio (M4A) encoding should be supplied, while for video the M4V encoding should be provided. Additional encodings are beneficial since they increase the chance that native HTML <video> or <audio> elements can be used (which may be hardware accelerated), instead of the flash player. See HTML5 browser media support. The default user-interface can be themed using jPlayer themes. The theme is global (it applies to all media player instances), and is configured by loading a CSS stylesheet. Play button, is hidden while playing. Pause button, is hidden while paused. The poster image (e.g. JPG/PNG) for a video. Metadata loaded: duration, width, height. Data at playback position is available. Have data to play for a while. Enough to reach the end without stalling. Creates a new media player. The player is instantiated with default controls. Adds a media source. The source may be specified as a URL or as a dynamic resource. You may pass a null link if you want to indicate the media types you will use (later) without already loading data. Returns the user-interface controls widget. Returns the current playback time. Returns the current playback time, expressed in seconds. The duration may be reported as 0 if the player has not yet loaded the media to determine the duration. Otherwise the duration is the duration of the loaded media, expressed in seconds. Returns the media source for the given encoding, which must have previously been added using addSource(). Mutes or unmutes the playback volume. The player starts or resumes playing at the current time. Event that indicates that playback paused. The event is fired when playback has been paused. Returns the current playback rate. Event that indicates that playback started. The event is fired when playback has started (or is being continued). Returns whether the media is currently playing. Returns a control progress bar. The state reflects in how far the media player has loaded the media, and has determined its characteristics. If possible, the player sets the current time to the indicated time (expressed in seconds). It may be the case that this only works after the player has already loaded the media. 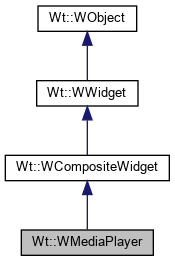 A control button is typically implemented as a WAnchor or a WPushButton (although any WInteractWidget can work). You should use this method in conjunction with setControlsWidget() to bind buttons in a custom control interface to media player functions. The default control widget implements all buttons using a WAnchor. Sets the user-interface controls widget. This sets a widget that contains the controls (buttons, text widgets, etc...) to allow the user to control the player. Widgets that implement the buttons, bars, and text holders should be bound to the player using setButton(), setText() and setProgressBar() calls. Setting a 0 widget will result in a player without controls. For an audio player this has the effect of being entirely invisible. The default controls widget is a widget that can be styled using a jPlayer CSS theme. This modifies the playback rate, expressed as a ratio of the normal (natural) playback rate. Not all browsers support this function. Binds a control progress bar. The progress bar for the WMediaPlayer::Time indication should be contained in a WContainerWidget which bounds the width of the progress bar, rather than setting a width on the progress bar. This is because the progress bar may, in some cases, also be used to indicate which part of the media can be seeked, and for this its width is being manipulated. You should use this method in conjunction with setControlsWidget() to bind progress bars in a custom control interface to media player functions. Sets a text place-holder widget. This binds the widget that displays text such as current time and total duration of the loaded media. This sets the size for the video. The actual size of the media player may be slightly larger, if the controlWidget take additional space (i.e. is not overlayed on top of the video). CSS Themes for the default jPlayer controls support two formats (480 x 270 and 640 x 360). The default video size is 480 x 270. This modifies the volume, which must be a number between 0 and 1.0. Returns a text place-holder widget. Event that indicates a time update. The event indicates that the currentTime() has changed.